If you've been on Wallpapering Fog before, you'll know I got quite excited about Google+. I liked it a lot when it came out and predicted big things. I still think it was a great starting point, but Google's overhaul today has me changing my mind. Yes it looks prettier, but dive deeper into what Google is doing and it spells disaster. Fundamentally, social networks need to be about you and me. We don't go to them because they're Facebook, or Google+, we go to them to find things we like, from people we know. Google+ has become all about Google, not about you. 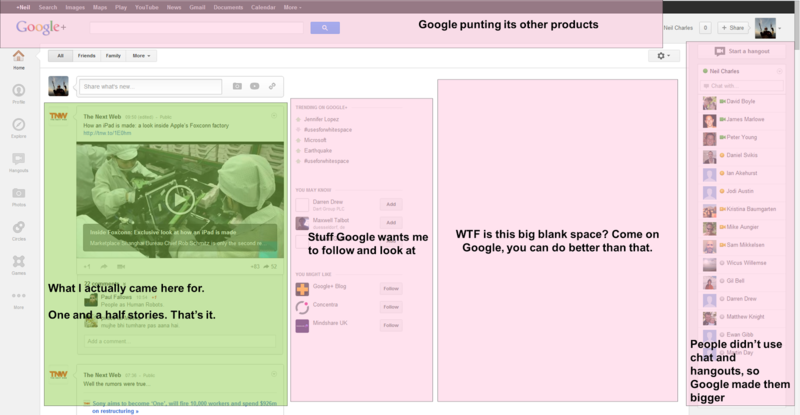 On my nice big widescreen monitor at work, this is what Google+ looks like. The green bit is what I came here for and it's showing one story. One and a half if you're generous. That stream holds the things I've chosen to look at. And now the red area; things Google would like me to look at. Corporate Google has obviously decided that hangouts and chat are a USP. Never mind that I've never used them, they're now huge. The top bar is punting multiple other Google services, including search. Yahoo do that. This is not a good thing. Come on Google, your own browser does tabs, I can have Google+ and Google Search open at the same time if I want. This is the thinking that saw Microsoft take the chart below, and conclude that because nobody uses the menus in Windows Explorer, what they really need to do is make them bigger. As I've written before, it takes a special kind of management interpretation to decide that people not using a product means that you should market it harder. Google's gone awfully corporate recently and is starting to behave more and more like Microsoft as it makes a land-grab for your time and cross promotes all of its products. Maybe it was inevitable, but for a fledgling social network, it's not the way to win us over. Give the people more of what they want, not more of what you'd like them to want. Edit: The top "hot on Google+" story today is from a guy who's flipped his monitor into portrait format to make Google+ readable. It's not a spoof. I rest my case.